Behind The Scenes of "MUCH" with Busdriver. Earlier this month, Busdriver released ‘Thumbs’, his second mixtape of the year. The video for the third single on the tape “Much” was directed by Milwaukee-based multi-media artist Wes Tank and his crew. As a Los Angeles native, Busdriver has incorporated music and rapping in his everyday life since he was nine years old, releasing his first solo album “Memoirs of the Elephant Man” in 2001. Today, Busdriver continues to create as an active rapper and producer. He’s worked and collaborated with a number of noteworthy musicians such as Milo, Open Mike Eagle, Aesop Rock, Flying Lotus, Danny Brown, and Del The Funky Homosapien. Communication about the video’s filming began between Tank and Driver months prior to its inception. The final idea for the shoot was manifested in 48 hours. Tank recalled, “I was playing a show at Linneman’s and Driver showed up. It was a Friday and we realized the only time we would be able to shoot would be the following Sunday, leaving just the Saturday in-between for pre-production. This meant assembling a crew, finding a camera and Steadicam rig, rounding up as many dancers as possible, and finding a location to shoot in. Luckily, Dan Peters was documenting the Linneman’s show for DocUWM’s Cream City Soundcheck series, and while he was miking me up, he offered up his help on any future shoots. I ended up calling him the next day. He was available for Sunday. We ended up shooting on his C-100. He also connected us with Jim Michaels, who graciously let us borrow his MOVI Steadicam unit.” The serendipity of this shoot ignited a feeling of purpose for the crew. Knowing the short window of opportunity of these variables and the need for them to fall into the appropriate places caused some nervousness. As these factors resolved, these initial jitters transformed into excitement and additional creativity. Inspiration for the long take style of the video derived from films such as Alfred Hitchcock’s “Rope”, Bela Tarr’s “Werkmeister Harmonies”, and most recently “Birdman”. All of these films utilize the technique to create the illusion that the film is done in one shot. Executing this technique requires significant effort in order to make something this complex a reality. Details such as cinematography, editing, and color grading are vital to the success of it’s seemingly authentic continuous shot. For the setting of the video, Tank inquired about an old house he had lived in, an ideal place to execute his vision. “My top choice for a house to use was a place I used to live in on Pierce and Hadley. My friend lives there now and he was happy to let us spend the afternoon shooting there…this was completely last minute, I owe all of these people favors.” The details were set. Tank acquired a talented crew, consisting of Joel Van Haren, Kelly Anderson, and Mikal Floyd-Pruitt, as well as Domo, Becky Cofta, Casey O’Brien, and Chelsie Collins. Tank made sure to appreciate and recognize the devotion of his crew, who sacrificed their time that Sunday and missed the Packer game that was on. As the song begins, Driver walks into the backyard of a Riverwest house, where there are a few people chilling by a bonfire. In the background is Domo, turning up with a carefree style. As Driver walks toward to the stoop of the home, we see more backup dancers, synchronizing themselves to Driver’s characteristic cadence and Kenny Segal’s distinct beat. The video continues with Driver walking and rhyming throughout the home, in somewhat of an aimless fashion. The setting is lively. There are children jumping on a sofa and money being thrown in the air. The backup dancers reappear in various rooms with the same choreographed dance moves that were exhibited out of the house. The video ends with Driver quickly biking down an alleyway, riding the same children’s bicycle that he arrived to the scene in. The spontaneous finale solidifies the theme of momentariness that is present throughout the video. The actual filming process took only three hours and was “easy to edit”. Tank added, “Colorist Ryan Reeve helped us blend the different lighting conditions together and gave Driver that glow that seems to increase over the course of the video.” This was the first time that everyone had worked together in this capacity. Anderson remarked, “it was a dream working with one my rap heroes and Wes Tank is a ringleader extraordinaire.” Tank graciously acknowledged that he was blessed to have such a talented crew by his side. Later he texted Van Haren saying “we should work on another project with the ‘same’ crew, but it auto-corrected to “sane” crew, to which [Van Haren] replied: Sane Crew Productions”. The result of this team’s work is an entertaining and engaging music video. The synergy between the cast and crew is evident in the success of the video’s quality and delivery. It was clear that these guys were having a great time. 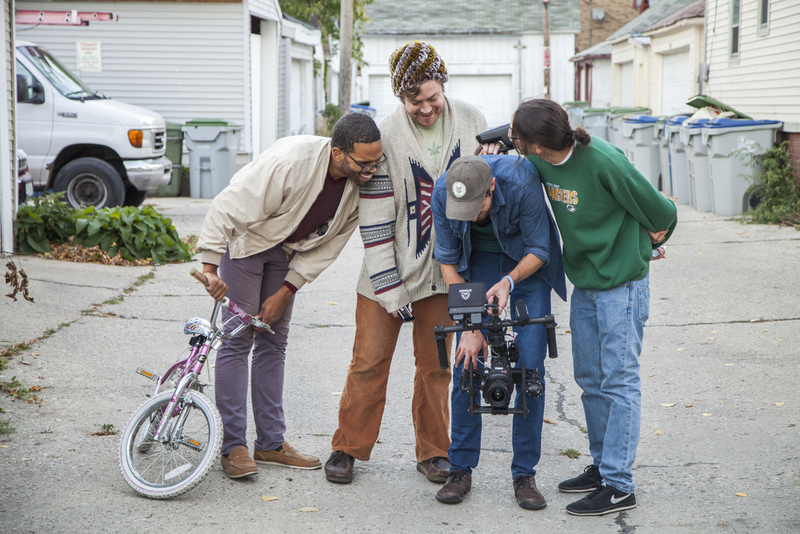 All in all, we hope to see more from Busdriver and Sane Crew Productions.